Since the creation of sports, I am sure people have been asking how to throw the perfect sports party. Although I am sure location has changed over time with the invention of radio and television, we now have the luxury of hosting parties in the comfort of our own homes. My party-throwing experience is limited to mostly college apartment football parties, but in my defense, I have put much thought into this question over the years. 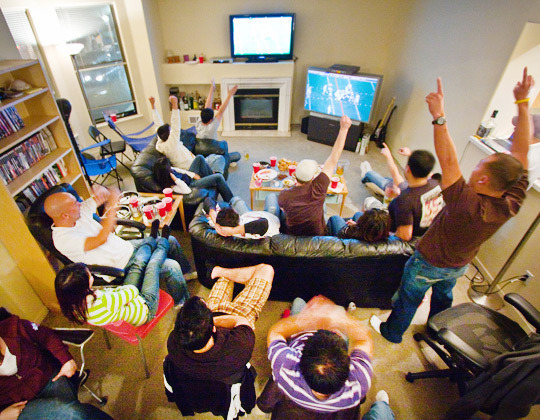 So here are my personal 7 rules to throwing the perfect sports party. 1. Clean and clear all parts of the house where guests will be enjoying the game. This mean none of your personal belonging should be left out -- find space in the closet or under your bed to put away your papers, magazines, and random junk. The only things that should be visible to your guests are the food, seats, tables, and TV. Make sure there is clear path to the food and drink so people do not need to walk in the way of others. This means possibly setting up two areas of the room with food and drinks. 2. Have a TV that fits the size of the room. For most standard-sized living rooms, any TV 42 inches or larger should do the trick. 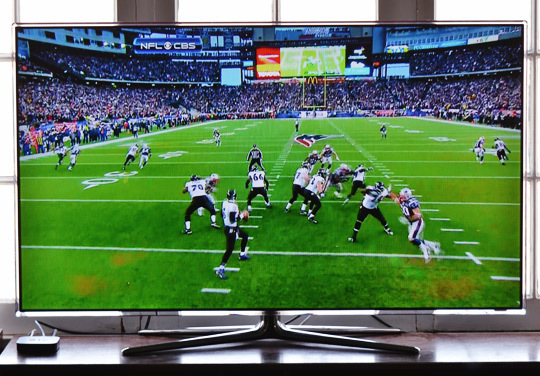 Anything smaller and you will see people slowly inch towards the TV, which ends up making it harder for the rest of the room to see. Of course, owning a sound system is a plus, but to be honest, the sound from most standard TVs today are loud enough to do the trick. On the other hand, surround sound will always bring another dimension to the atmosphere of the party. 3. Always have appetizers set up before the start of the game. In the Asian American culture, we all know food is what brings people together, so don’t be the host that needs his guests to ask if they can open the chips after they have arrived. Also remember that you can never have too much dip for your chips as long as you have the chips for it. I would have at least a guacamole-based dip and the generic salsa -- if you are feeling really ambitions, throw in a spinach cream dip. The presentation can be mind-blowing as well. 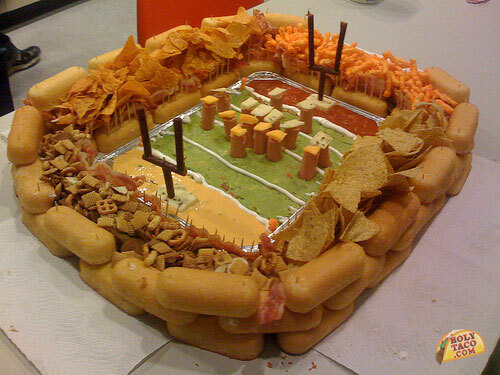 Nothing compares to a snack stadium. 4. Drinks are always a key component, and depending on your demographic, you may or may not have alcohol. But since most of our readers right now on Gym Class All Stars are of age, I will go ahead and say beer is a must. Make sure all the beer is in the fridge 6 hours before the game starts unless they are already chilled at the store. Don’t be in a rush to pull out all the beer because there is a good chance others will bring over a friendly six-pack. Other key drinks to have are sodas, juices, and some form of punch. The secret to making a quick and simple punch is orange sherbet mixed with sprite and a few nicely-cut orange slices. 5. Have enough food -- I cannot stress this enough. Many times people end up trying to get the perfect amount so they are not left with a ton of leftovers, but it is always better to have extra food than to not have enough. The secret to this is to always have food that can be prepared quickly during halftime when it is clear there is not enough food. You can pick up a large bag of precooked frozen wings at Costco. These taste decent enough, are easily prepared, and have come in handy at many of my own parties. It is okay to order food as well, but the main thing is to have the food be both easy to share and easy to eat. 6. Have a second viewing room. This is not common and clearly isn’t a must, but trust me, it is worth having. At every game, you have a variety of fans -- some who are just casually there to enjoy the game, while others who are intensely invested. I know at critical moments in the game I would rather walk away from the noise and have a place to focus on the game. While in college, I would always open up my bedroom which had a second TV, and I remember watching memorable events such as Big Ben carrying the Steelers to a Super Bowl win over the Cardinals and the Big 12 championship game-winning field goal by Texas. Then we would join the rush of running out after a huge play to join the masses in screaming and jumping up and down. 7. The last rule is to know which game to throw a party around. If the game is not interesting, your party likely won’t be either. Of course sometimes even major sporting events like the Super Bowl and the national championship game have flopped, but there is only so much you can do. It is also not always smart to have fans of both teams which could cause unnecessary tension for all in the room. 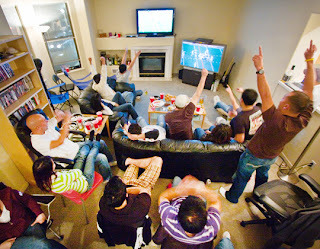 Out of respect, everybody should feel like they are in a safe environment to cheer for their team during the party. Trash talk should only be exchanged between friends that respect one another and feel comfortable to take it if they are going to dish it out. I hope you find these 7 rules helpful, and feel free to check out past “How to Guide” articles. Photos courtesy of Holytaco.com and apartmenttherapy.com. True. Having two viewing areas is legit.